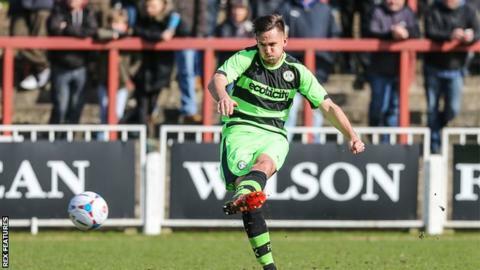 Forest Green Rovers' hopes of automatic promotion from the National League were dented as they were held to a draw by play-off hopefuls Braintree. Braintree took the lead through Kenny Davis' penalty after Chez Isaac was brought down by James Jennings. The visitors equalised shortly after through Darren Carter's driven effort into the bottom left-hand corner. Mitch Brundle nearly won it for Braintree but his firm header struck the bar as the game ended all square. Forest Green have now drawn their last five games meaning they sit six points behind leaders Cheltenham with just three games remaining, whilst Braintree are one place outside the play-offs in sixth. "I thought we dominated the game, especially the first half - the penalty was disappointing to concede and from there you're chasing your tail a little bit. "We scored a good goal and played well first half; the pitch was very bumpy and lively. We're frustrated but we move on. "Fair play to Cheltenham - they've been consistent enough but I think they've got one hand on the trophy - we've got to keep playing well and make sure we go in to the play-offs in good form." Match ends, Braintree Town 1, Forest Green Rovers 1. Second Half ends, Braintree Town 1, Forest Green Rovers 1. Substitution, Braintree Town. Dan Sparkes replaces Kenny Davis. Mitch Brundle (Braintree Town) is shown the yellow card for a bad foul. Substitution, Forest Green Rovers. Brett Williams replaces Jon Parkin. Mitch Brundle (Braintree Town) hits the bar with a header from the centre of the box. Assisted by Chez Isaac with a cross. Substitution, Forest Green Rovers. Anthony Jeffrey replaces Elliott Frear. Attempt missed. Darren Carter (Forest Green Rovers) left footed shot from outside the box is too high. Attempt missed. Kenny Davis (Braintree Town) header from a difficult angle on the left misses to the left. Assisted by Sam Habergham. Attempt saved. Michael Cheek (Braintree Town) right footed shot from the right side of the six yard box is saved. Charlie Clough (Forest Green Rovers) is shown the yellow card for a bad foul. Attempt saved. Kurtis Guthrie (Forest Green Rovers) right footed shot from outside the box is saved.